Executing a Thomas Keller recipe well is not for the fiscally faint of heart. A recipe that calls for expensive cuts of beef and homemade veal stock would deter most homecooks, especially those on a budget. Nevertheless, I maintain that Bouchon is a cookbook suited to the homecook who seeks to please guests with unpretentious food. The preparation may reek of pretension, but the goal is to efface the effort before the dish arrives at table. Formality does not belong in the home. Formal home dinners tend to be over-prepared, fussy affairs that position the food, instead of sociability, at the center of the event and make everyone, especially the cook, uncomfortable and unable to live up to expectations. I want my food to make people feel like they are in a home, not in a restaurant. Keller offers a way to impose the high standards he sets in his kitchen on food that ought to make people relaxed, satisfied, and animated. But, for most of us, learning to meet his standards is an on-going education. Instead of beginning with the long recipe as Keller sets it out on the page, I will go straight to my adaptation. And, with no apologies, I have considerably adapted his recipes. As I observed in my first Keller recipe, he places great emphasis on purity and impurities. The point is to prepare each component of the dish separately in order to make each one distinct in flavor. I am convinced he is correct. 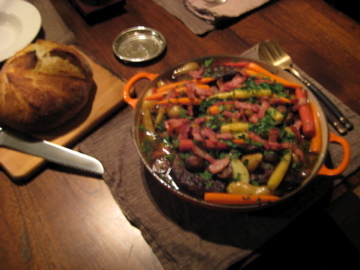 Begin the stock four days before you plan to serve this meal and the short ribs 2-3 days before the meal. Believe me, this is a project. Drain the bones in a large colander and rinse with cold water to remove any scum. It is important that the bones be rinsed while they are hot; if they are allowed to cool first, the impurities will cling to the bones and go into your stock. Once the liquid is at a simmer, skim and then stir in the tomato paste. Add the remaining ingredients, bring the liquid back to a simmer, and simmer for 4 hours: Skim, skim, skim. Turn off the heat and allow the stock to rest for 10 minutes. Strain the stock into a big bowl through a fine-meshed colander. Do not press the solids in the strainer. Return the stock to the cleaned stockpot. Slowly bring to a simmer and simmer until the stock is reduced to 2 quarts. It should have a rich brown color. Trim away excess fat and any silver skin from the short ribs. Cut the meat into pieces approximately 1 1/2 to 2 inches by 1 inch thick. Line a baking sheet with paper towels. Season all side of the meat with salt and pepper. Heat 1/8 inch of oil in a large sauté pan over high heat. When the oil is hot, add only as many pieces of meat as will fit comfortably in a single layer; do not crowd the pan or the meat will steam rather than brown. Once the meat has browned on the first side, turn it and continue to brown the meat on all sides, about 5 minutes total. Transfer the meat to the paper towel-lined baking sheet. Brown the remaining meat in batches, adding more oil to the pan as necessary. Add the onions, carrots, leeks, garlic, thyme, parsley, and bay leaves to the reduction and toss together. Cut a piece of cheesecloth that is about 4 inches larger than the diameter of the pot. Wet the cheesecloth and wring dry. Place the cloth over the vegetables and fold over the edges to form a “nest” for the meat. (The cheesecloth will allow the liquid to flavor and cook the meat but prevent bits of vegetable and herbs from clinging to it.) Place the short ribs on the cheesecloth and add enough stock to come just to the top of the meat. It is important that the liquid doesn’t evaporate too quickly. If the pot does not have a tight-fitting lid, cut kitchen parchment to cover the meat under the lid. Bring the liquid to a simmer over medium-high heat. Cover the meat with the parchment lid, if using, then cover the pot with the lid. Place in the oven and reduce the heat to 325. Braise the beef for 1 1/2 to 2 hours, or until the meat is very tender. Transfer the meat to an ovenproof pot or container. Remove and discard the cheesecloth. Strain the braising liquid twice through a fine strainer or a medium strainer with a clean dampened tea towel or cheesecloth, straining it the second time into a saucepan. Discard the vegetables. Bring the liquid to a boil, spooning off the fat as it rises to the top. Strain the liquid over the beef. Let it cool, then cover and refrigerate for at least 1 day, or up to 3 days. If the the potatoes are small (less than 1 ounce each), leave them whole. Otherwise cut them into 1/2-inch thick slices. Place in a large saucepan, along with the salt, peppercorns, thyme, bay leaf, and garlic and add cold water to cover the potatoes by 1 inch. Bring to a boil over high heat, then reduce the heat and simmer for 10 to 15 mins, or until the potatoes are tender. Drain the potatoes and transfer to a plate. Discard the seasonings. Once they are cool, slice the whole potatoes lengthwise in half. Set aside. Peel the carrots and trim the tops. Cut the carrots lengthwise in half. Place in a saucepan, add the ingredients, and cover with about 1 1/2 inches of water. Place over high heat and bring to a boil. Reduce the heat and simmer the carrots for 4 to 5 mins. Drain the carrots and transfer to a plate to cool. Discard the seasonings. Crisp the lardons in a frying pan; transfer to paper towel to drain of fat. Trim away the mushroom stems flush with the caps. Heat the butter in a large skillet over high heat. Add the mushrooms, reduce the heat to medium low, season with salt and pepper to taste, and cook gently, tossing often, until the mushrooms are lightly browned and tender throughout, 2 to 3 minutes. Set aside. Place the container with the beef in the oven for a few minutes just to liquefy the stock. Remove from the oven and turn the oven up to 400. Carefully remove the pieces of beef to a deep ovenproof sauté pan. Strain the liquid over the beef. Place the pan in the oven and warm the beef for about 5 mins, basting occasionally with the cooking liquid. Add the potatoes, carrots, mushrooms, and onions and toss gently. Return to the oven for an additional 5 to 10 mins, or until the vegetables and meat are hot. Meanwhile, rewarm the lardons in a small skilet. Remove the sauté pan from the oven and gently toss in the parsley. With a slotted spoon, divide the meat and vegetables among serving plates or bowls. Spoon some of the sauce over each serving. Distribute the lardons among the plates. Serve with Dijon mustard, if preferred. I was happy with how this dish turned out, although I expected the wine reduction to be more dense. However, the flavors were satisfyingly complex. I scraped off the remaining fat that had congealed after two days in the fridge. When it came time to eat, I served it with the NYT’s Slow-Rise Bread, a salad of greens with a tarragon-dijon vinaigrette, and an apple crumble tart with vanilla ice cream. A meal that is far more complex than a list of its parts would appear.